Phi Phi News is not as easy to find as you might think. The best updated commentaries on big issues are the 'RussellAbroad blog' the 'Phi Phi Island' Facebook page and the 'phiphiislands' twitter feed. These sources give you what is going on from people based on Phi Phi Island for the last 20 years. The typical Phi Phi News is that a 1500 day trippers came to the island, 20 dive boats and 10 snorkel and tour boats go out on the near 20 km of reefs. Speedboats and longtail taxi boats ply between the main pier and Long beach and send people to the resorts in the north of the island. They also do some tours out to Maya Bay. In the evening the restaurants and cafes are full, and seafood eaten, the bars go busy and the party people dance on Loh Dalum Beach bars. Simple paradise like this is hard to beat. However in addition to this, Phi Phi Don Village is built within a small area making the streets and pathways more similar to an Asian Bazaar than a quiet tropical retreat. The big village atmosphere where the locals work and play hard, the day trippers, the diving and the fun party scene, ensures that Phi Phi News, the 'what's happening on the islands' is a constant stream. Everything is so condensed and concentrated as Phi Phi is 90% mountains. There are no cars or other artificial barriers between each other so the island is a real melting pot. The Phi Phi News from RussellAbroad blog is primarily about what's on and what's cool to do on the islands of Thailand but when it comes to real, 'real time' events the RusselAbroad Blog gets the news from people behind the scenes. The busy holiday scene has such a throughput of people that it is no surprise that there is bad news every now and again. People have got hurt or violent when they drank to much and party to hard; the very, very occasional diver or snorkeler gets into difficulty, deaths form heart attacks, food poisoning have all happened on Phi Phi over the years. In 20 years of visiting the island I have been safe and not come close to trouble so it is often the extraordinary that makes a headline and not the common place. What’s the in-place on Phi Phi. The Dojo Bar and the Reggae Bar are always busy early on and beach bars like the Apache and Slinky Beach Bar take off later at night. But this varies every week as every bar tries to out do itself and the next bar. To hear the 'drum beat proper', pick up the fliers from each of the bars every night either at the pier or near the Reggae Bar and you will quickly know what's what. Phi Phi Hotel News revolves around new hotels or guesthouse, hostel opening or an established resort opening up a new room type which is better than what was there previously. This is news perhaps to those in the hospitality industry but of not much use to visitors. However where there is big news is in great prices for hotel rooms. In low season (May 1st till October 31st) the room rate is often 40% less than high season and with the monsoon months of June and September to avoid, it means that May July August and October can have excellent value. In addition to this there are some great Phi Phi Hotel Deals such as Free Night Specials, Fixed Night Promotions, Special Discounts, Early Bird Offers Honeymoon offers. These deals make the news in the same low season months so you can find yourself saving upto 70% from high and peak season prices. Phi Phi Diving News is a lot more variable. Key information is weather, cloud cover and wind, visibility the starting dates of courses like the PADI Open Water, Advanced, Dive master and even Dive Instructor. The most up to date info here is on the Facebook 'Phi Phi Island' page. The likes on this page points you to many dive shop pages. The glorious tropical weather is always news. Hot, dry, windy, wet, humid, thunder and lightning the weather is continually evolving. For the best information see the weather forecast is at Phi Phi Weather news. It also has a rain radar which is a superb way of understanding what is going on especially in low season. The article lists gives descriptions of the weather by month. 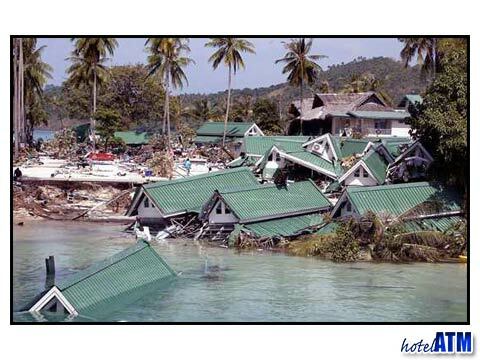 Phi Phi News went massive when the 2005 Phi Phi tsunami hit the shores Tonsai Bay. This surge of water was not destructive to life but created huge confusion. The death wave came from the north on Loh Modee. The tsunami wave swept through the village like an arm knocking over toy soldiers wiping out whole bungalow complexes. Although the clear up was completed in record time, the chaos and suffering were difficult to bare. There were over 1,500 deaths.